Michael Carrick divides opinions. His detractors label him weak; someone who crumbles under pressure, who can’t handle a physical midfield battle and who does nothing but pass the ball sideways and backwards when he should be imposing himself on matches the way truly great midfielders do. His supporters highlight his assured passing and defensive discipline and see him as a metronome that doesn’t shine itself but sets the tempo for the rest of the team. Caught in the middle of the debate is a third group of people who can appreciate his contribution but long for a more adventurous and seemingly more confident Carrick they remember from seasons past. In this article I will take a look at his performances in the five seasons he has been at Manchester United. I will look at each season in detail, highlight his strengths and weaknesses and pay special attention to how his game has changed over the years. To start I will focus on his performances in the Premier League. In a later section I will look at his performances in the Champions League to see whether there are any differences in the way he plays in Europe compared to England. I should warn you: this is going to be long. 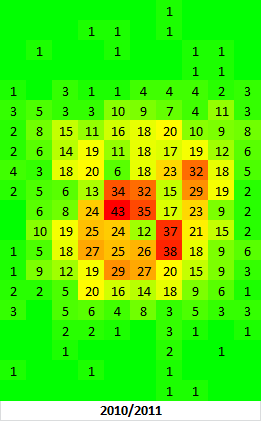 In this and all other heat maps the pitch has been divided into twenty 5.25 metre segments in the y-axis and ten 6.8 metre segments in the x-axis, and the number in each square indicates how many passes were attempted in that section of the pitch. As you can see there are two high frequency passing zones, one in the opposition half in an attacking midfield position, slightly to the right of centre, and the other in his own half in a defensive midfield position, again slightly to the right of centre. This right-sided bias was a feature in all five seasons, with 64.00%, 59.94%, 54.94%, 53.05% and 56.51% of his passes played in the right half of the pitch. The right-sided bias was also clear when comparing his passes on the wings. In 2006/2007 passes on the left wing made up 4.16% of his total passes while passes on the right wing made up 10.74%. For the other four seasons the corresponding figures were 4.88%/11.73%, 4.88%/7.54%, 8.32%/7.17% and 5.71%/11.83%, with 2009/2010 the only season to break the pattern. Unsurprisingly the majority of his passes, 80.16% to be exact, were played in the central area of the pitch marked AM1 through DM2. Passes in CM (CM1+CM2) made up the largest part of that with 33.20% of his total passes originating from there. DM (DM1+DM2) was second with 25.70% of total passes and the remaining 21.26% were played in AM (AM1+AM2). Above is a graph illustrating the frequency with which he attempted passes of different lengths. His average pass length was 19.49 metres, his median pass length was 16.76 metres and his longest attempted pass was a 74 metre ball from his own half to the left corner flag. His three most frequent pass lengths were 13, 10 and 16 metres which made up 5.32%, 5.15% and 5.04% of his total passes. Passes 20 metres or shorter made up 62.36% of his total passes while passes over 40 metres made up 6.08%. His short to long pass ratio was 10.25. His passing accuracy for short passes was 86.99% (990 completed/1138 attempted). 23.46% of his short passes were forward passes, 49.30% were sideways passes and 27.24% were backwards passes. His passing accuracy for medium length passes (21-40 metres) was 79.34% (457/576) and his forward, sideways and backwards pass percentages were 51.22%/23.78%/25.00%. His passing accuracy for long passes was 48.65% (54/111) with forward, sideways and backwards ratios of 74.77%/9.01%/16.22%. Finally let’s look at his passes into the penalty area and his key passes. In total he made 40 key passes, 1.43 per 90 minutes, and attempted 117 passes into the opposition penalty area. 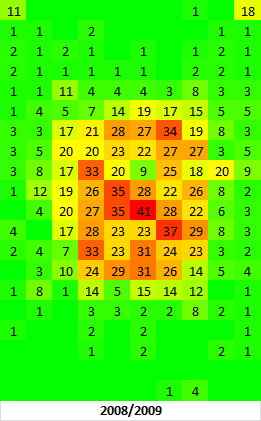 Of those passes, 15 were open play crosses and 40 were corner or free kicks. Overall crosses made up 47.01% of his passes into the penalty area. His cross success rate was 36.36% while his open play pass success rate (excluding crosses) was 25.81%. The summer of 2007 saw Anderson and Owen Hargreaves join United’s midfield but despite the increased competition for places Carrick maintained his status as a regular starter. He made 49 appearances in all competitions and played 2200 minutes in the Premier League despite missing about a month of the season due to injury. Per 90 minutes he attempted 66.3 passes, a small increase on his first season and adjusted for playing time he contributed a career high 12.71% of United’s passes. The average starting y-coordinate of his passes stayed constant at half a metre from the halfway line in his own half, but United as a whole (Carrick excluded) moved just under two metres higher up the pitch, so relative to the rest of his teammates he actually took up a slightly deeper average position than in his first season. His passing was more evenly spread out, though the highest frequency area was again found in a defensive midfield position slightly to the right of centre. 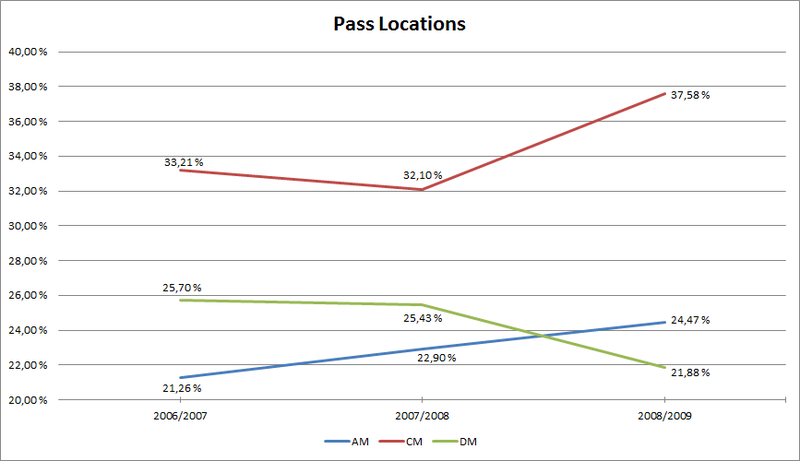 Overall his passing location percentages were similar to 2006/2007; the only notable changes were his CM1 percentage dropping from 16.38% to 15.12% and his AM2 percentage increasing from 16.44% to 17.72%. His passes were slightly longer than they were in 2006/2007. His average pass length increased to 20.28 metres while his median pass length increased to 16.96 metres. His percentage of short passes dropped from 62.36% to 60.19% while his percentage of long passes increased from 6.08% to 8.02%, and his ratio of short to long passes fell to a career low 7.5. With fewer short passes and more long passes you might expect his passing accuracy to fall but actually his accuracy improved across the board. He completed 859/975 short passes, 88.10%, 410/515 medium length passes, 79.61%, and 66/130 long passes, 50.77%. The only range where his passing accuracy fell was in the 31-40 metre range, dropping to 68.31% (97/142) from 72.22% (117/162) the previous season. His lower accuracy in the 31-40 metre range is explained by the large increase in forward passes in that range. In 2007/2008 70.42% of his 31-40 metre passes were forward passes compared to only 54.32% in 2006/2007. 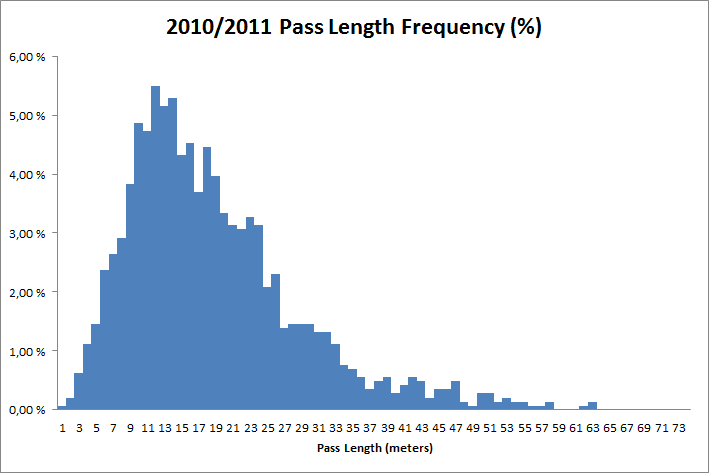 In fact in all pass length ranges there is a trend of a larger portion of the passes being forward passes, and a corresponding decrease in the portion of sideways passes. For his short, medium and long passes the percentage of forward passes increased from 23.46%/51.22%/74.77% to 24.31%/51.65%/86.92% while his sideways passes fell from 49.30%/23.78%/9.01% to 47.59%/22.91%/5.38%. These numbers suggest that the improvement in his passing accuracy could be due to actual improvement in his passing ability, and not simply due to him being more conservative with his pass selection. He played far fewer passes into the penalty area, 89 compared to 117 the previous season, but the difference is explained by the large decrease in the number of corner kicks he took, and if we exclude them the number of passes into the penalty area he attempted was 75 compared to 77. The success rate of his passes improved from 30.77% to 37.08% and when looking only at open play passes his success rate increased from 25.81% to 41.54%. Even though he played fewer passes into the penalty area and took fewer corner kicks he maintained his key passes at the same level, 1.39 per 90 minutes. 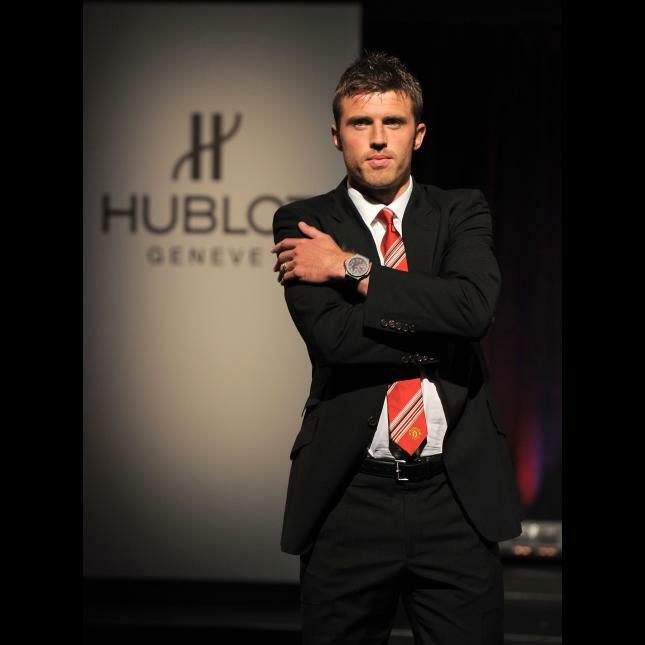 For Carrick 2008/2009 was the culmination of three years of steady progress. He played in the most advanced role he has played in, with the average starting y-coordinate of his passes about a metre from the halfway line in the opposition half. He attempted more passes per 90 minutes, 71.3, than ever before, and a higher percentage of those passes, 52.66%, were played in the opposition half than in any other season. He also attempted considerably more shots per 90 minutes, 1.81 compared to 1.25 in 2006/2007 and 0.94 in 2007/2008, than before. 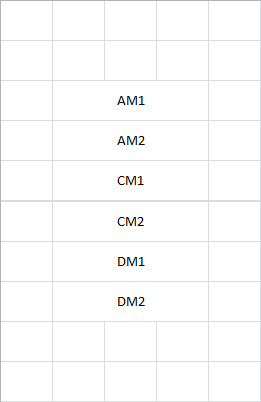 The changes in AM, CM and DM percentages highlight his more advanced role. His AM and CM percentages, 24.47% and 37.58%, were career highs while his DM percentage, 21.88%, was a career low. Playing in a more advanced role his passes into the penalty area increased to 4.63 per 90 minutes when his second best season (2006/2007) was 4.19, though the 2006/2007 figure is inflated by the large number of corner kicks he took, and if we exclude them the difference is even larger: 3.66 per 90 minutes in 2008/2009 compared to 3.07 in 2007/2008 and 2.76 in 2006/2007. His key passes increased to 1.54 per 90 minutes which combined with his four Premier League goals and seven assists made 2008/2009 his most productive season at the club. There were small changes in the length and accuracy of his passes but for the most part his passing was similar to the previous two seasons, with some allowances for the more advanced role he played. The average length of his passes fell to 19.80 metres while the median length rose to 17.21 metres. Short passes made up 61.12% of his total passes while long passes made up 6.86%, a short-to-long ratio of 8.91. His short pass accuracy fell slightly to 87.56% (866/989) while his long pass accuracy rose to 62.16% (69/111). The large increase in his long pass accuracy is explained by his passes in the 41-50 metre range where he completed 68.92% (51/74) of his passes compared to 53.85% (42/78) the previous season. After the more adventurous forward passing in all pass length ranges of 2007/2008 his passing became slightly more conservative in terms of forward, sideways and backwards pass percentages in 2008/2009. His forward pass percentages for short, medium and long passes fell to 23.15%/44.40%/81.98% while his sideways and backwards pass percentages increased across the board. Undoubtedly his more advanced role will have affected these figures to some degree. 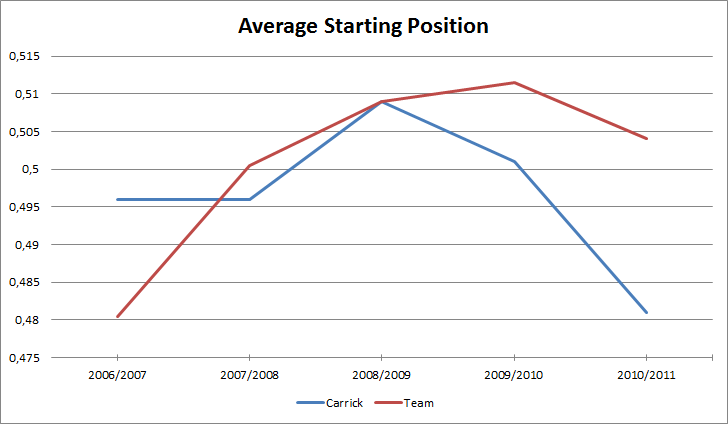 2009/2010 was not a good season for Carrick. During his first three seasons at the club his career had followed an upward trajectory; with each new season he became more involved in United’s passing play, took more shots, created more scoring chances and played in a more advanced role, but 2009/2010 saw him regress in almost every measurable way. His passes per 90 minutes rate and the playing time adjusted percentage of United’s total passes he contributed fell to career lows of 65.0 and 11.24% respectively. Similarly his per 90 minute rates in shots, passes into the penalty area, key passes, interceptions, loose ball wins, tackles attempted and blocks all fell from their 2008/2009 rates. The only statistics that improved were his aerial duel attempts per 90 minutes which rose from 0.36, 0.37 and 0.26 in his first three seasons to 0.84 and his aerial duel success rate which rose from a collective 20% in his first three seasons to 50% in 2009/2010. His passing was more evenly spread out over the pitch than in previous seasons. 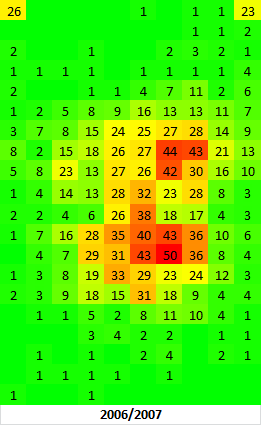 He attempted at least one pass in 154 of the 200 5.25×6.80 areas in the heat map which is more than any other season bar 2006/2007, though it’s worth remembering he attempted 430 more passes in 2006/2007 than 2009/2010. 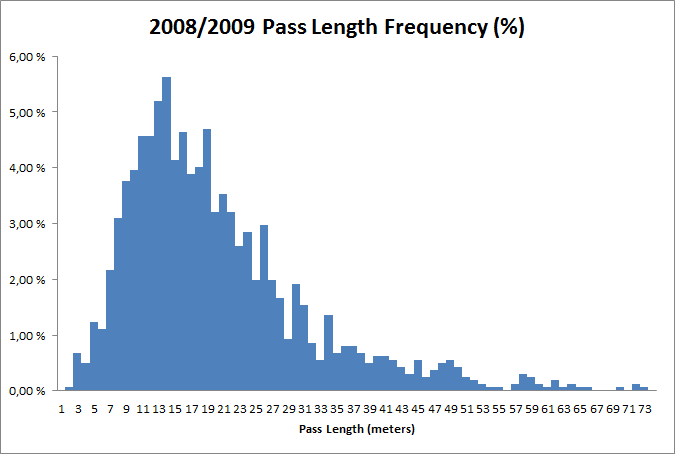 His pass length ranges give us the first signs of a clear change in his passing which was to come in 2010/2011. His short to long pass ratio increased from 10.25, 7.5 and 8.91 the previous three seasons to 13.61. His percentage of long passes fell from 6.86% to 4.59% and his percentage of short passes rose from 61.12% to 62.44%. 2009/2010 was in many ways a season of transition for Carrick and the increased reliance on short passes was one of the areas which hinted at what was to come in 2010/2011. 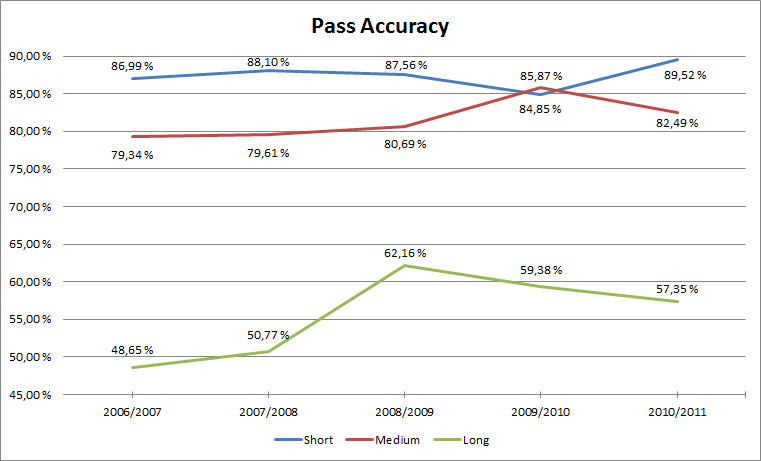 In terms of passing accuracy 2009/2010 was a mixed bag. His short pass accuracy fell to a career low of 84.85% but his medium length pass accuracy increased to 85.87%, up from 79.34%, 79.61% and 80.69% the previous three seasons, and he topped the 90% mark for only the second time in his United career when he completed 91.06% and 92.38% of his passes in the 16-20 and 21-25 metre ranges; the first time he topped 90% was in 2007/2008 when he completed 91.56% of his passes in the 16-20 metre range. His passing directions were almost identical to 2008/2009. His forward, sideways and backwards ratios were 33.84%/38.49%/27.67% compared to 33.99%/38.57%/27.44% the previous season. When you look at his 2009/2010 numbers it’s hard to deny that he underperformed. The natural question is why? It’s tempting to look to the 2008/2009 Champions League final. Carrick was widely criticized for his performance in the final, and even though I mentioned in my tactical review of that match that I thought much of that criticism was unfair, it’s certainly plausible that his poor showing in the final combined with the criticism led to a drop in his confidence levels which negatively affected his performance in 2009/2010. The general weakening of United through the departures of Ronaldo and Tevez could be another contributing factor, or maybe it was just natural regression back to his “actual” level after punching above his weight in 2008/2009. As is almost always the case I don’t think there is a single easy answer. Whatever the case, 2009/2010 was largely a season to forget for Carrick and it’s probably best that we move on to 2010/2011. For better or worse the Carrick of 2010/2011 wasn’t the same player he was in his first three seasons at United, and the main reason for this is the deeper role he played. In 2008/2009 his average starting position was just past the halfway line, about a metre into the opposition half, but by 2010/2011 his average starting position had dropped almost three metres deeper from that position, despite the average positions of his central midfield partners and other teammates staying roughly the same. In the above graph 0.5 is the halfway line and each change of 0.005 denotes a change in average starting position of half a metre on the pitch. In 2008/2009 52.66% of his passes were played in the opposition half; in 2010/2011 that number was 44.26%. In 2008/2009 he played 24.47% of his passes in the attacking midfield areas AM1 and AM2 and 21.88% of his passes in the defensive midfield areas DM1 and DM2. In 2010/2011 the corresponding figures were 16.77% for AM and 26.93% for DM. Similarly passes in the attacking third (excluding corner kicks) dropped from 16.75% to 11.48% while passes in the defensive third increased from 12.86% to 16.21%. 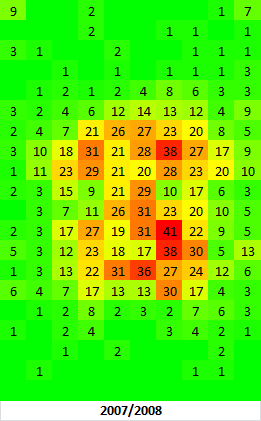 In addition to his passing starting from deeper areas his passing was also more restricted than in any other season. 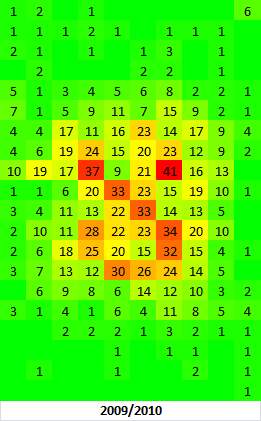 Of the 200 5.25×6.80 areas in the heat map he attempted at least one pass in only 140 of them, the fewest of the five seasons. The shift to a style of play dominated by short passes that began in 2009/2010 was completed in 2010/2011. His average pass length fell to 18.27 metres and his median pass length fell to 16.16 metres. Short passes made up a career high 65.07% of his passes with most of the increase coming from the 0-10 metre range where the percentage of total passes increased from 16.70% to 20.11%. His long passes stayed constant at 4.73% while his medium length passes fell from 32.97% to 30.20%. His short to long pass ratio increased slightly to 13.75. As well as becoming shorter his passing became more conservative. Forward passes made up only 31.11% of his total while his sideways pass percentage of 45.16% was a considerable increase on the previous seasons (38.79%, 36.36%, 38.57%, and 38.49%). His short passes were particularly conservative with 57.22% going sideways and only 20.21% forward. His passes into the penalty area became even more infrequent. In total he attempted 22 passes into the penalty area, 1.00 per 90 minutes, and only 4 of them found a teammate. His key passes fell to 0.73 per 90 minutes. With his passes becoming shorter and more conservative it’s no surprise his accuracy increased. His short pass accuracy was 89.52% (837/935). He couldn’t maintain his exceptional medium length pass completion from 2009/2010 but his 82.49% (358/434) was still the second best in his career. His long pass accuracy was 57.35% (39/68). As you might expect given his deeper role he took fewer shots, 0.86 per 90 minutes, in 2010/2011 than in any other season, and between the lack of shots and key passes, and in general more conservative passing it is clear his offensive contribution isn’t what it was in previous seasons. The question is whether his defensive contributions improved enough to make up for that loss? While it’s impossible to answer that based on the data alone his career high interceptions, 2.82 per 90 minutes, combined with the eyeball test suggest he has improved defensively in the last few seasons, but trying to quantify just how valuable that improvement is and whether it offsets the loss of offensive value is beyond my current analytical capabilities. Carrick’s performances in the Champions League in many ways mirror those of the team as a whole. With Sir Alex opting to take a pragmatic approach to the competition United have in recent years played a more conservative type of football in the Champions League than in the Premier League. This is reflected in the lower goals scored (2007/2008-2010/2011: 1.58 in the Champions League vs. 2.05 in the Premier League) and goals conceded (0.67 vs. 0.73) per match numbers. Other metrics reinforce the point: in the Champions League United take fewer shots (14.92 vs. 17.89), attempt more passes for every shot they take (35.52 vs. 31.18), and the average position of the team is roughly two metres deeper than in the Premier League. In away matches in particular United have become quite adept at doing just what is required and nothing more; an approach which has drawn praise from some and criticism from others. 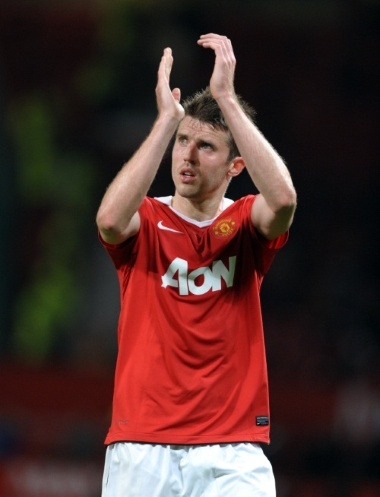 Carrick’s role in the Champions league has been predominantly the deeper, more defensive role he played in the 2010/2011 Premier League season. Even in 2008/2009 when he had, in terms of offensive contribution, his best Premier League season, in the Champions League he had already transitioned to the more defensive role. While his teammates’ average positions were the same in the Champions League and the Premier League, Carrick played almost three metres deeper in the Champions League than he did in the Premier League. As a result, when looking at his statistics from 2007/2008-2010/2011 we see his shots, key passes and passes into the penalty area were all lower in the Champions League than in the Premier League while his defensive statistics like interceptions and loose ball wins were all higher. His interceptions in particular were notably high (3.74 per 90 minutes in the Champions League vs. 2.22 in the Premier League) and increased year-on-year, reflecting the growing emphasis on interceptions and defensive positioning in the way United defends as a team. 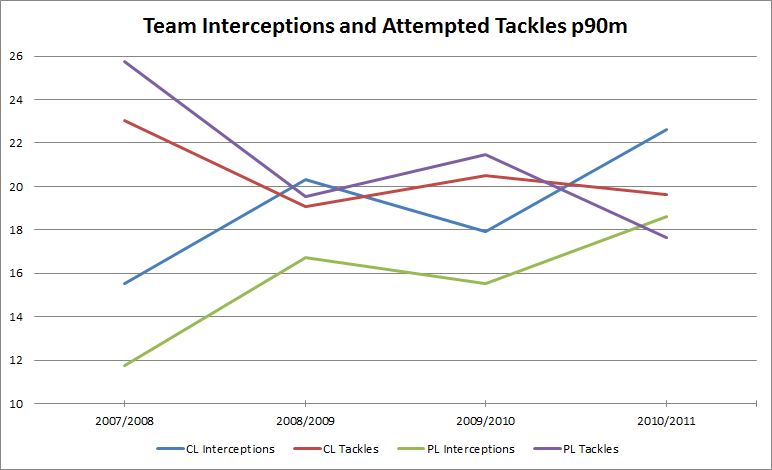 In the graph below you can see a clear upward trend in the number of interceptions made by the entire team per match in both the Champions League and Premier League while reversely the number of tackles attempted has fallen. His passes in the Champions League were more heavily weighted toward short passes than they were in the Premier League. In the four seasons from 2007/2008 to 2010/2011 short passes made up 61.67%, 63.36%, 65.17% and 65.69% of his passes while the corresponding Premier League figures were 60.19%, 61.12%, 62.44% and 65.07%. At the same time his passing became more polarized as his long pass percentages either stayed roughly the same (2007/2008 and 2010/2011) or increased (2008/2009 and 2009/2010) relative to his Premier League percentages while his medium length pass percentages fell every year. With the small sample sizes involved it’s hard to determine whether this was an intentional change in his game or whether it’s just random fluctuations caused by the small data sample. As his passes became shorter they also became more conservative. In the same four seasons forward passes made up 22.11%, 20.67%, 20.11% and 18.13% of his short passes in the Champions League compared to 24.31%, 23.15%, 21.93% and 20.21% in the Premier League. His backwards pass percentages were higher in three of the four seasons, 2007/2008 was the only exception. His deeper role is highlighted by the differences in his pass location percentages. In the Champions League passes in the attacking midfield area AM made up 19.55%, 16.46%, 14.61% and 15.11% of his passes when in the Premier League the corresponding figures were 22.90%, 24.47%, 21.15% and 16.77%; the gap between the 2008/2009 figures is particularly noteworthy and shows how different his roles in the respective competitions were that season. The same trend was visible in his passes in the attacking third (excluding corner kicks) which made up 11.97%, 9.20%, 9.74% and 11.65% of his total passes in the Champions League compared to 14.63%, 16.75%, 14.91% and 11.48% in the Premier League. His passing accuracy was similar in both competitions; the only real difference was in his medium length passing which was slightly more accurate in the Champions League. This could be explained by him attempting fewer medium length passes in the Champions League and suggest that he preferred to either play it short and safe or play it long, whereas in the Premier League he would be slightly more willing to attempt a riskier medium length pass. The data is too limited and the sample too small to say for sure but it does seem like a plausible suggestion. Part of the problem with the Carrick debate is that there is a larger debate going on at the same time about what the role of a central midfielder is in the modern game, and obviously your stance on that issue will have a large effect on how you evaluate Carrick. That is why one person can look at his passing and bemoan a lack of adventure and creativity while another applauds his ability to retain possession. There is no doubt that Carrick’s game has changed over the years. His first three seasons at Manchester United saw steady improvement which peaked in 2008/2009 when he had his most productive season at the club. After a difficult 2009/2010 season he redefined himself in a deeper role and had his best defensive season to date. The question is whether that change made him a better player or not? I don’t know. The data alone is too limited to answer questions of ‘better’ or ‘worse’ and the results of my eyeball test are inconclusive. I think it’s fair to say that defensively he is better now than he has ever been, but as mentioned earlier, whether that defensive improvement is enough to offset the drop in his offensive production is very difficult to say. My gut feeling is that in the context of the Manchester United team, surrounded by creative attacking players like Rooney, Nani, Giggs, Valencia and others, the marginal utility of the offensive value Carrick can provide is small enough that exchanging that offensive value for increased defensive value is a trade-off worth making. In other words even if he is in some sense a more limited player now than he was two years ago, his value to the team is greater. Of course in a different team, system or midfield dynamic that could all be reversed and the exact opposite may be true. So the end result is that after all these words (I did warn you at the start that this was going to be long) we may be no closer to knowing for sure whether he is a better player now than he was a few years ago. Whatever your thoughts on him I hope this article has given you a better understanding of who Michael Carrick is, how he plays and how his game has changed during the five seasons he has been at Manchester United. Congratulations to everyone who made it all the way through to the end. I hope you enjoyed it as much as I did. The 2006/2007 figures are missing the Sheffield United away match due to incomplete data. For the 2009/2010 figures I omitted the Fulham away, Wolves home and Wolfsburg away matches because he played those matches in central defence. The Champions League figures cover only 2007/2008-2010/2011 because unfortunately I couldn’t find data from 2006/2007.